Maxime Heroux wills his way to the win at WPT Montreal. 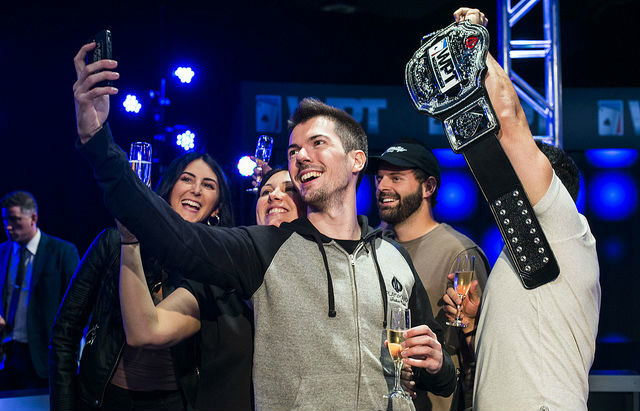 Montreal’s Maxime Heroux outlasted the 606-player field of the World Poker Tour Montreal Main Event at the Playground Poker Club to take home his first WPT title and the first place prize of C$ 403,507 ($317,554). Heroux entered the final table second in chips, sitting right behind eventual runner up Pat Quinn. David Peters, perhaps the biggest name at the final table hovered in third, with about 56bb, while Derek Wolters, Brendan Baksh and Eric Afriat, who was vying for his second WPT title, all felt the pressure, sitting below 20 bbs. Despite having a number of short stacks to start the table it took roughly two hours before the field was whittled from six to five. David Peters, the 2016 Global Poker Index Player of the Year, was on solid footing when the day started but after getting doubled through in multiple hands he found himself sitting on the bottom of the chip counts. First to act, Peters shipped his final seven blinds holding . The action folded around to Quinn in the big blind who called, turning over . The found the door closing quickly on Peters’ potential double. The turn card provided some life but the river ended the perennial high roller’s run in Montreal. Peters exited in sixth taking home CAD $78,050 for his efforts. A little bit of the buzz was removed from the room forty-five minutes later when former WPT Champion Eric Afriat, looking for a spot, raised half his stack from the button only to be shipped on by Derek Wolters in the blinds. Afriat committed the rest of his chips and turned over . Wolters flipped over the suited . The board got worse and worse for Afriat as it ran out . The quads overkill shipped Wolters the pot and Afriat’s bid for his second title ended in fifth for CAD $95,370. A mere five hands later Derek Wolters was involved, yet again, in a knockout. Folded to Wolters in the small blind, he applied the pressure to the short-staked big blind, Brendan Baksh. Wolters shipping the , was called by Baksh’s . At risk, Baksh simply needed to hold. The flop of was clean, but the on the turn left California’s Baksh looking for one of three outs. The fell on the river and so did Baksh. His fourth-place finish brought him CAD $124,310, the largest score of his career. As play continued, Maxime Heroux and Derek Wolters took turns claiming the chip lead with Pat Quinn trailing but surviving. Then came an impasse where a massive flip for the majority of the chips took place. Pat Quinn raised from the button and Heroux, holding the chip lead, put in a call in the small blind. Wolters, three-bet from the big blind which ushered Quinn out of the way. After a brief tank, Heroux shipped on Wolters, putting him to a decision for his tournament life. Wolters ended up making the call, tabling . Heroux rolled over for the monumental flip. The flop came down providing Wolters four extra outs to go along with his two overs. That would be the closest Wolters would get as the turn and river awarded Heroux a massive chiplead and after taking his shot Derek Wolters finished the day in third place for CAD $173,220. With nearly a 4-to-1 chiplead over Quinn it took Heroux 17 hands of heads-up play to seal the deal. On the final hand Quinn had yet to gain much traction on Heroux, limped the button and Heroux checked his option. The action flop of found Quinn sticking his chips in the middle and Heroux calling for the win. Quinn held for the open end straight draw, backdoor flush with two over cards. Heroux had a made hand showing down , a pair of fours with a gutshot straight flush redraw. The turn made two pair for Heroux and the river brought in the full house as well as the WPT Championship. You may have the payouts here wrong. Sure was wrong! Thanks for the heads up!